Product Details: Use anytime for: Essential Amino Acid Delivery, Nitric Oxide Production, Muscle Recovery Acceleration, Improved Energy and Focus. Free Form Amino Acids for Rapid Uptake. Essential Amino Acids including BCAAs. Supports Recovery Before, During & After Exercise. Train Longer & Harder with beta-Alanine. Natural Energizers & Antioxidants. 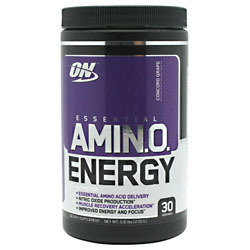 Supports Nitric Oxide Synthesis. Other Ingredients: Malic Acid, Natural & Artificial Flavors, Tartaric Acid, Silicon Dioxide, Calcium Silicate, Citric Acid, Sucralose, Gum Blend (Cellulose Gum, Xanthan Gum, Carrageenan), Lecithin, FD&C Blue No.2, FD&C Red No.40, Inulin.